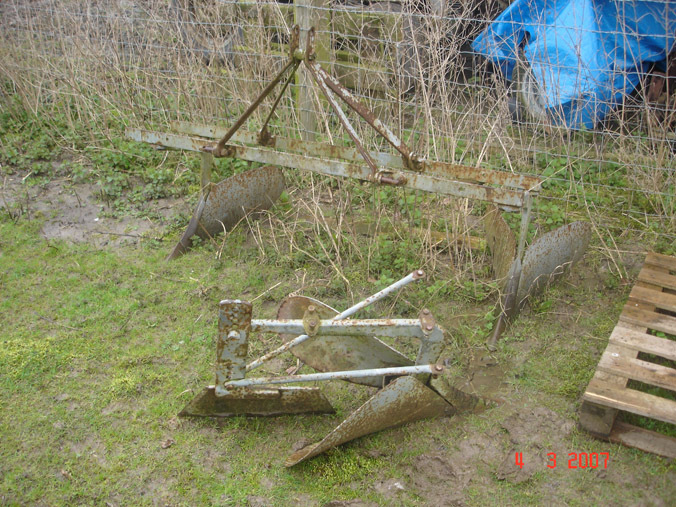 This was a present from a good family friend, after it was spotted in the corner of an agricultural engineers yard in South Wales. 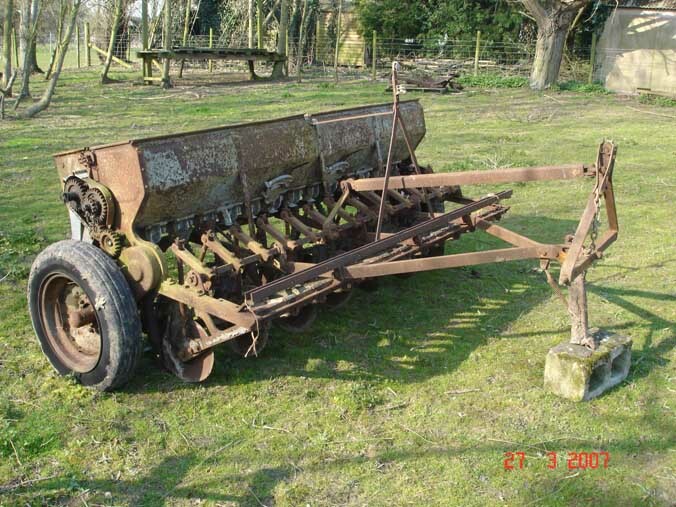 It would have been used on a local farm on the Gower Peninsula for potato planting. Despit this, it appears to have been hardly used, with the points showing very little wear and is in outstanding original condition. This is now used on the garden every year for potato and runner-bean planting (2 bodies only). 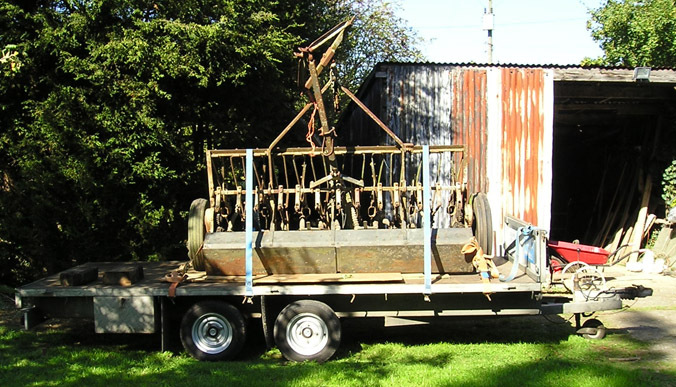 This was purchased along with the Ferguson Crane and spent its working life on a local farm, lifting a small patch of potatoes every year. 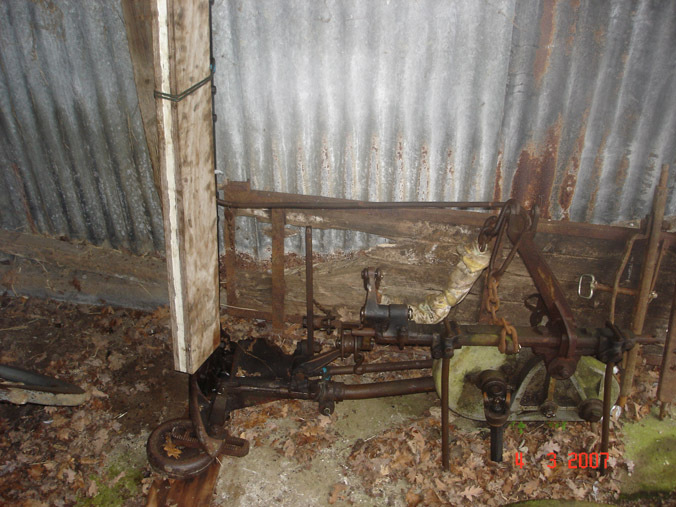 It is showing that it has had a hard life, although it still works, a few of the tines are bent, and the shear is worn, but should restore easily. 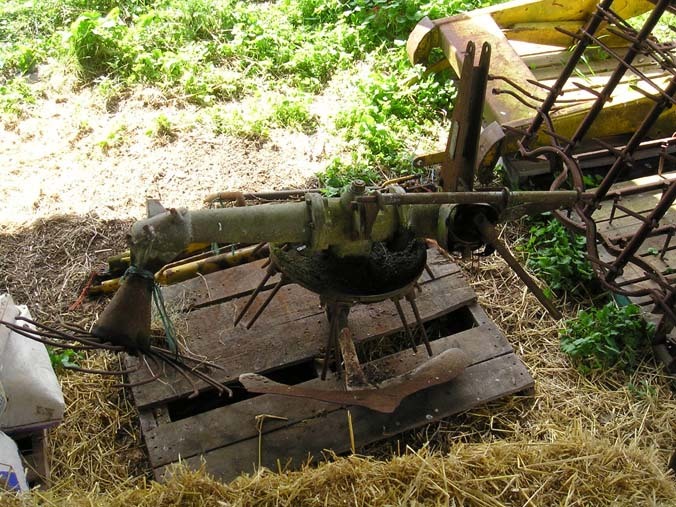 This is one of the few Ferguson Implements at Rhodds's Farm which is not used. The Mower was purchased from Reading through a contact made at a Cheffins Vintage Auction. It was in a poor way having sat outside for some time. The various seized parts were freed off and new belts and PTO shaft were fitted; but the break-back mechanism still requires some attention. The original blade was in good condition (although now requires sharpening), and second blade was acquired and fitted with MF combine sections, which work well when topping thistles. It has been used for topping and hay mowing for two seasons, performing well. However, when cutting the last area of hay this year the securing nut for the blade stripped its thread and had to be welded quickly to facilitate finishing the mowing; this will need repairing before next season. The purchase of a Ferguson Mower during 2004 led me to be offered this 703 baler from the same person in Aberdulais, South Wales. I agreed the purchase some time before collection, and unfortunately the baler, sitting outside in a wood, deteriorated somewhat further before I could pick it up. Details of the collection of the baler can be viewed here. Since its purchase I have stored it under cover, but have done very little with it; the plunger is currently seized, as are the knotters (spares were collected from Chepstow on the way back to Suffolk) and the string and charge chambers require completely new metal. I am unsure as to whether to restore the baler (when time permits) or pass it on and look for one in better condition. This drill was purchased from a nursery in Lawford, Essex, where it had done very little work and had been extremely well looked after. It is the 13 row, disc coulter model. There are a couple of areas that require attention, including a new tube and tyre, but with this done it would go straight to work. The exterior has been badly painted with very thick paint, but this has resulted in the metal being well protected. My second drill was standing in an old building where I found some other Fergy bits and pieces. This shed has now been pulled down, and the drill was collected at Easter 2007, before the weather did too much damage. The drill is in good original condition, but is missing some of the delivery tubes and the feed mechanism is stuck. The fertiliser box on the other hand is in outstanding original condition.